Some of us eagerly wait for monsoon to enjoy the chill weather, the smell of the first rain, the romantic feel associated with it, and some curse the monsoon for the inconvenience is causes. Love it or hate it, you cannot the ignore monsoon season. Despite its countless benefits, monsoon does mess up with your otherwise clean home. From dampening furniture to leaving a foul smell, there are countless problems that rains may cause to your home. 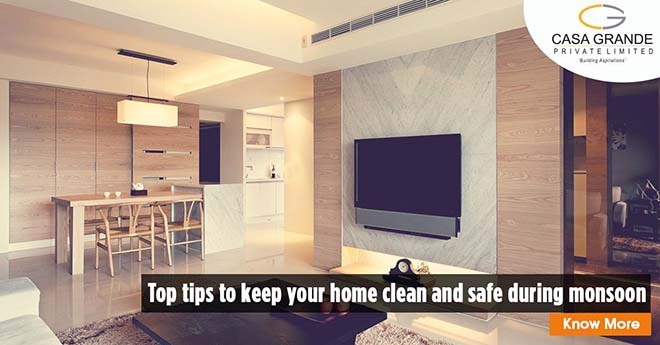 Here are a few tips on how to keep your home clean and safe even during the monsoon. Before monsoon season sets in, do a pre-monsoon check to make sure that none of your walls, ceilings, or doors have any leakage. Furthermore, if you live right below the terrace, make sure your terrace is waterproof, if not, waterproof it immediately. If you own an independent house, it might cost you a generous amount, but if you live in an apartment, this procedure is mostly taken care and the expenses are shared by the whole community. Either way, this is worth every penny spent as it will protect your house from molds and mildews. With water shortage increasing day by day, it is wise to harvest the rain water. If you do not have a rain water harvesting (RWH) system in place, it is better to install one in your house. Moreover, rainwater harvesting has been made mandatory in three storied buildings in Chennai. If your home is already has an RWH, then you need to check and maintain it before the monsoon starts to get rid of rats, house flies, mosquitoes, algae growth, lizards, and insects. From dampening to termite formation, wooden furniture and flooring are more prone to damage during the monsoon season. It is advisable to wrap unused wooden furniture with plastic during this season. Also, the essential wood furniture that needs to be used everyday can be wiped using dry cloth instead of wet cloth; the same holds good for wooden flooring too. Seal any gaps between your wooden flooring and walls to prevent termites. Also, if you see any termite invasion, get it cleaned as early as possible through a professional cleaning service. After wooden fixtures, floors need maximum attention, during the monsoon season. Firstly, remove any carpets well beforehand and seal them in plastic covers. Carpets get damp easily, and they are hard to clean. If your carpets are already dirty or damp, give them for carpet shampooing before securing them inside. Always use disinfectant-based cleaning agents to wipe your floors. Also, make sure to clean any dirt from floor as germs proliferate a lot during this season. Your linens like curtains, bed spreads, etc. needs to be changed more often in this season as they tend to get damp. It is advisable to change these once in a week or two. Washing and drying these linens can be tedious, during monsoon; therefore, one can either buy and use a stock of linens or get the ones you own washed and dried through a professional laundry service. Also, always keep your windows latched to prevent your curtains and home from getting wet. This season makes one vulnerable to a lot of water-borne diseases. Therefore, it is advisable to check if all the drains are clean and free of any clogs. If any of the drains are cluttered, get them cleaned out as quickly as possible. Electricity and water is a bad combination; it can be really fatal. Before the preset of this season, secure any loose lines in place. Also, during heavy, thunderous storms, disconnect sensitive electrical appliances like television, internet modems, personal computers, refrigerators, etc. As much as you can, take care of your home to keep it clean during this season. Your garden also deserves the same attention. During rainy season, weed your lawns; pull them up and spray herbicide all over the ground. Moreover, if there are any trees around the house, you must trim the branches. These heavy branches, hanging over your roof, can break and hit on your home during heavy storms.